Solaire Resort and Casino, a USD $1 Billion-worth integrated resort complex, is not only a premiere leisure and gaming destination in the Philippines. As of November 26, 2014, when The Theatre at Solaire was formally launched, Solaire complex is now also a state-of-the-art performance venue for theatre plays, musicals, dance performances, and concert events. Here’s a first-look photo essay of what to expect from the metro’s newest theater. 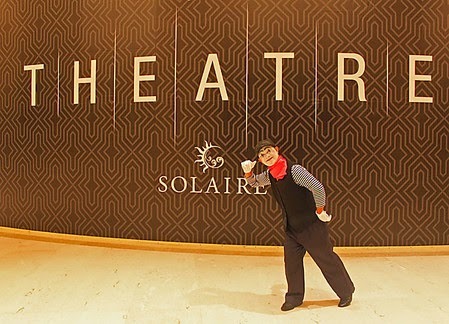 The Theatre at Solaire is located at the newly opened Sky Tower. It has a separate drop-off entrance from the hotel’s main building. Getting to the theatre’s foyer is a bit tricky because some of the elevators are not yet operational and not all of the staff is briefed yet on where to usher guests. But once you’re in this area, it should be easy for you to follow the signs that lead to the lobby. 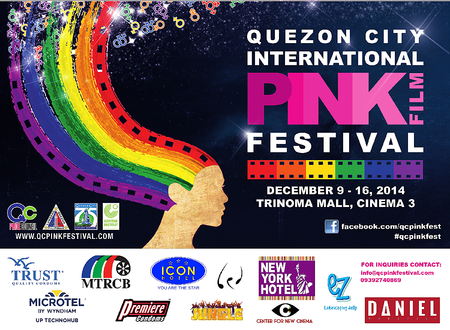 In celebration of its 75th anniversary as a city, Quezon City hosts Asia’s largest LGBT film event, the QC International Pink Film Festival. Forty-five films about lesbians, gays, bisexuals and transgenders from fifteen countries including the Philippines will be featured in the country’s biggest outing of queer films. 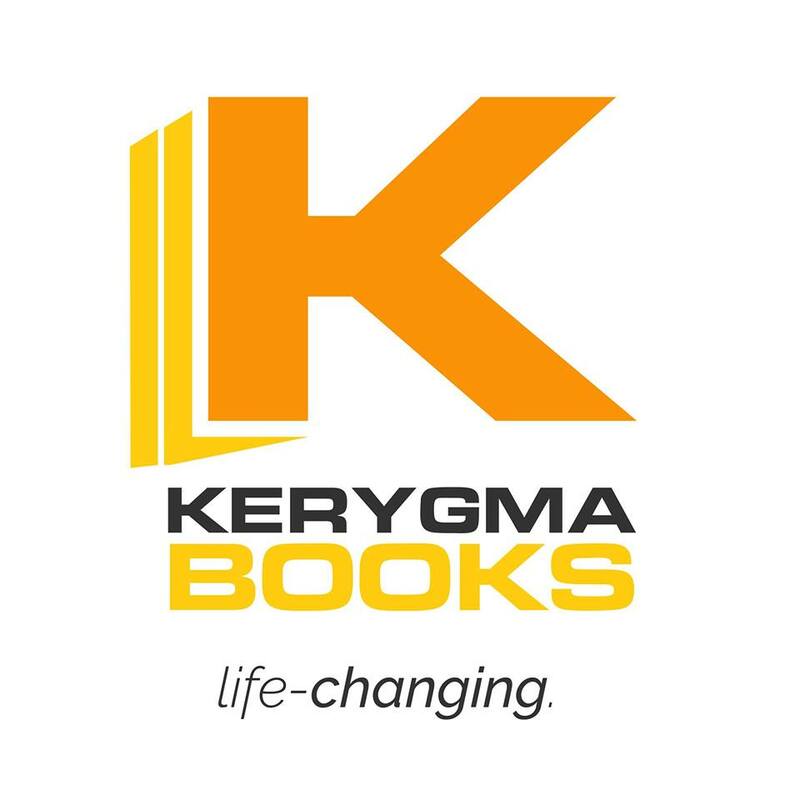 It will be held on December 9-16 at Trinoma Mall. The QC Pink Festival opens with the world premiere of prizewinning documentary filmmaker Nick Deocampo’s “#pinQCity,” about Quezon City’s LGBT community caught in its daily struggle to survive. 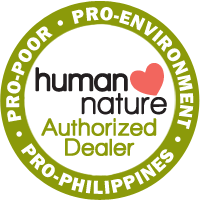 Are you Promdi and Proud? 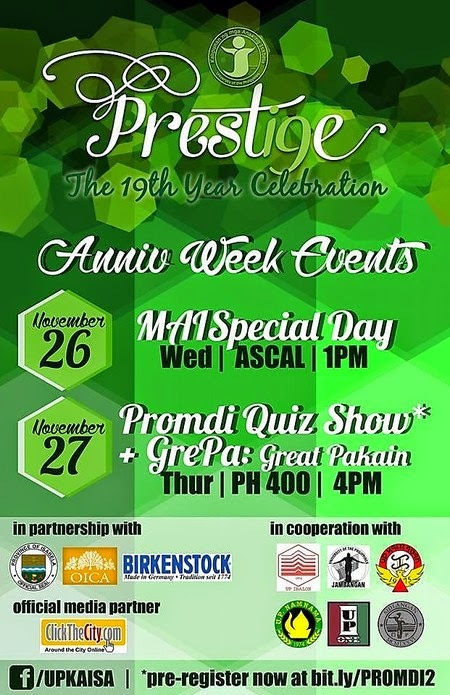 Join our organization, UP Kalipunan ng mga Anak ng Isabela (KAISA), as we celebrate our 19th Anniversary with a series of activities that embodies the Promdi spirit!. MaiSpecial Day: The Province of Isabela contributes a major part on the agriculture of the Philippines, particularly in corn production. In the advocacy of the organization towards cultural consciousness, this day aims to give away free corn kernels to the UP Community to promote one of Isabela’s major products. The Original High School Musical, which was voted as the No. 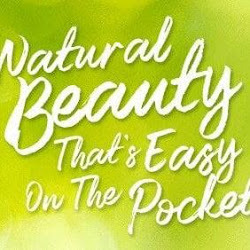 1 Greatest Musical in West End, will have more breath-taking performances that would take the show to a whole new level. So throw your mittens around your kittens and hand-jive the night away with the show that'll make you want to stand up and shout, 'A-wop-bop-a-loo-bop, A-wop-bam-boom!' 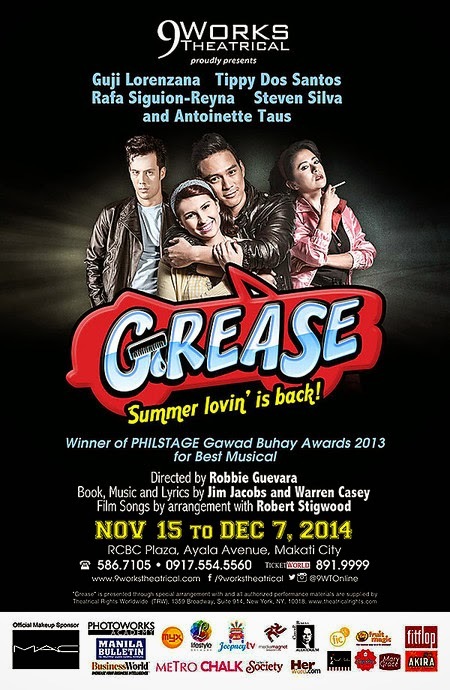 “GREASE” continues to rock the house down in Manila from November 14 to December 7, 2014 at the RCBC Plaza, Makati and will be directed by seasoned actor and director, Robbie Guevara. 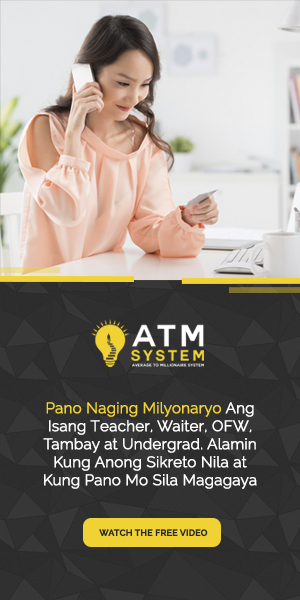 Your moment is finally here. 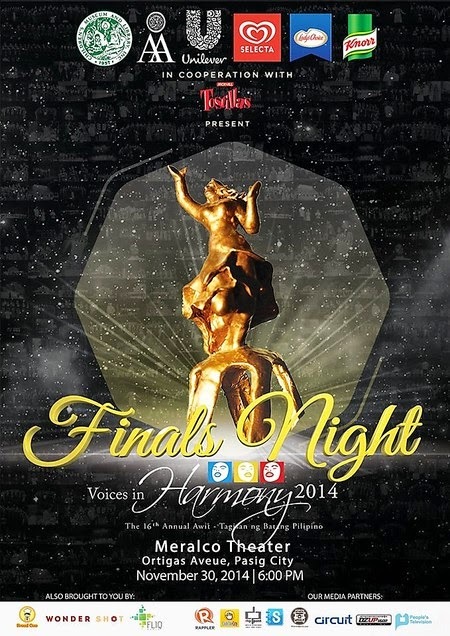 Experience the country’s grandest and most prominent choral competition of the year, with Voices in Harmony 2014: The 16th Annual Awit-Tagisan ng Batang Pilipino! 10 outstanding high school choirs will leave their hearts out on stage as they sing for the much sought-after Aria, and the opportunity to be named the Champion of Voices in Harmony 2014. Be part of this grand showcase of the youth’s musical excellence as we celebrate sharing our triumphs and victories through music. History has shown us how music can change the lives of people forever. Who will make history as they outperform every other choir and leave as victors of the competition? Fresh from his critically-acclaimed performance as the sublime paralytic in “Ang Huling Lagda ni Apolinario Mabini,” Roeder Camanag shall once again reprise his role in Gantimapala Theater’s El Filibusterismo. 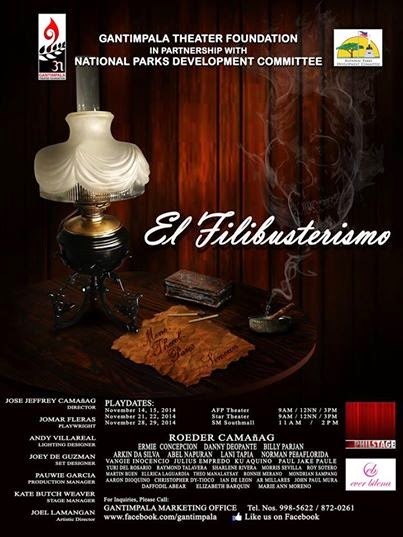 "El Filibusterismo" --- the novel of national hero Dr. Jose Rizal written by noted playwright Jomar Fleras narrates the return of the protagonist of Noli Me Tangere, Crisostomo Ibarra, under the guise of the wealthy jeweler named Don Simoun. The COMPETITION Section is accepting film submissions until November 21. In addition to films produced in Asia, we are pleased to welcome the entry of any feature-length films related to Asian people or countries and regions. Among the selected films to be screened during the festival in March, our international jury will select the Grand Prix (the Best Picture Award, with cash prize of JPY500,000) and the Most Promising Talent Award (with cash prize of JPY200,000), and other awards. Michael Bublé, the four-time Grammy award winner and Canadian superstar, is returning to Manila as part of his World Tour on January 31st 2015 - at the Mall of Asia Arena. It’s been more than 10 years since Michael’s last concert in Manila and he is very excited to come back and serenade Filipino fans with his much loved, chart-topping songs. Michael Bublé has been selling out Arenas across the globe, making this show one of the year’s hottest concert tickets. In London, he was originally slated to do six nights at the London’s O2 Arena, but had to add four extra shows when the first run sold-out in just five minutes! Following more than hundred packed shows this year, Philippine Educational Theater Association (PETA)’s phenomenal hit musical production returns to the PETA Phinma stage for a limited run this December. Last minute buyers who failed to snag golden tickets during the show’s re-run, balikbayans coming home for Christmas, and Aegis fanatics who are itching to belt out “Sinta”, “Luha” and “Basang-Basa sa Ulan” all over again, are all in for a treat as PETA produces twelve special shows of “Rak of Aegis” from December 05 to 14. 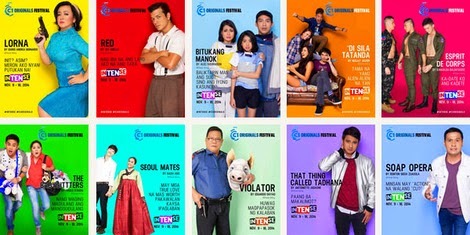 Cinema One Originals is an annual cinema event of the Philippines’ number one cable channel, Cinema One. Alongside the full-length digital movies made by today’s most creative Filipino directors, the film festival also features innovative short films, restored Pinoy classics, and new works by globally renowned masters.